Celtic harp traditions, 60s folk and electronic pop to create ‘atmosfolk'. 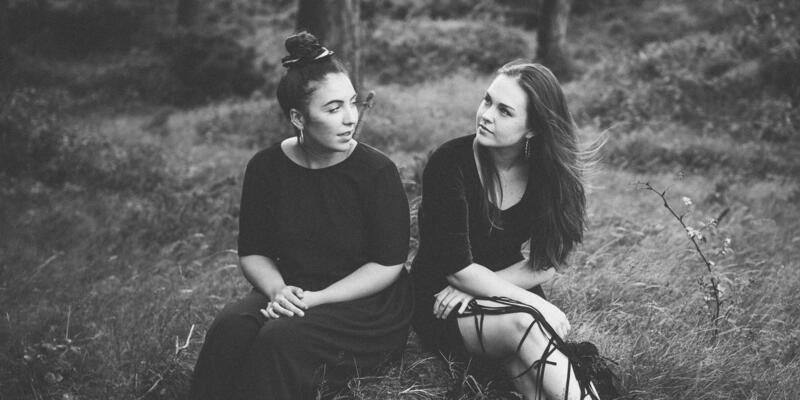 Saint Sister formed in November 2014, when Morgan MacIntyre and Gemma Doherty met at college in Dublin, drawing musical influence from early Celtic harp traditions, 60s folk and electronic pop to create ‘atmosfolk’—a mix of soulful vocal harmonies, dreamy synth and electro-acoustic harp. One of their first gigs saw them open the stage for Arcade Fire’s Will Butler. They recorded their debut EP ‘Madrid’ a year after forming, working with Alex Ryan (bassist with Hozier), and releasing it in November 2015. Support on Irish radio, including praise from across the Irish sea for their lead single by Huw Stephens and Phil Taggart, helped to go further and be playlisted on BBC Radio 1 and German national radio, 1Live. Follow-up single ‘Tin Man’ came out as part of Communion’s Singles Club in December 2016 and received continued support from national radio at home and abroad. Since then, tours have followed across Europe and appearances at SXSW and Eurosonic to name a few. A tour of Europe with Lisa Hannigan awaits.